Last week, it was no secret that one of the worst cold waves in American history was on its way. Government officials notified their residents to take care from the cold and weathermen warned to keep indoors. And of course, animal welfare officials told pet owners to make sure that their animals had a warm place to hide from the cold. But all those warnings were lost on one man. During the dangerously cold temperatures, brave Indianapolis Animal Care Services officers went house to house to check on city pets. At their final stop, they came upon a homeowner who had left his dog within a doghouse overnight. The poor pooch had nothing to block it from the freezing temperatures beside a small towel. The water in its water bowl had frozen solid. The dog had clearly lived a sad life. Officials say that when they found it, it was emaciated and living in a trash-filled doghouse. Horrifically, this poor dog was left out in the cold and its owner allowed it to freeze to death. Then the officers said they saw something that they couldn't believe. 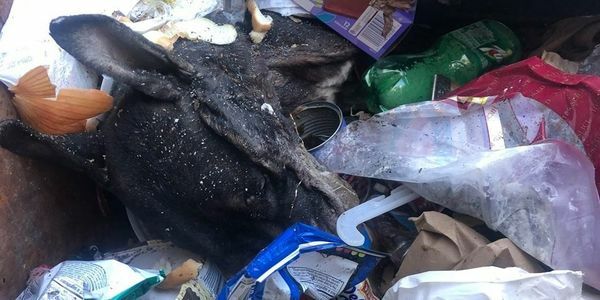 When the owner realized it was dead, he reached in, grabbed it and tossed it in the dumpster as if it "meant nothing." There is no excuse for this type of neglect or cruelty. Pet owners were given ample warning to prepare for their pets and city officials have publicized special resources for pet owners who might not be able to afford to care for their animals during such harsh weather. Yet this man ignored all of that and allowed his dog to die. In Indianapolis, it is against the law to leave a pet outdoors when it is 20 degrees or below or when the city has issued a wind chill advisory. However, the punishment is just a pathetic $200. In the case of this frozen dog, the pain and desperation it must have felt can only have been excruciating and a $200 fine does not come close to real justice.